Initially, when Curtis went into OCS, I didn’t know much about it and was expecting it to be next to next to no communication, and that I would only be able to encourage him by sending letters. For the first 10 days, I heard absolutely nothing, and by the end of that I was going a little crazy, as you might imagine. I started searching the internet for any possible people or phone numbers I could try to at least see if he was still there and doing okay. On day 10, I was once again disappointed that I hadn’t gotten any mail from him, but when I opened my email my mouth dropped when I saw a new address with his name in my inbox! As it turns out, they had military email accounts set up, and after week 3 he had access to a computer daily so we were able to communicate back and forth much easier. On top of that, he was able to call me once a week after the first 3 weeks were over. I seriously cried when I heard his voice for the first time in 21 days! I have written letters to him every night, and sent a few every 3-4 days. 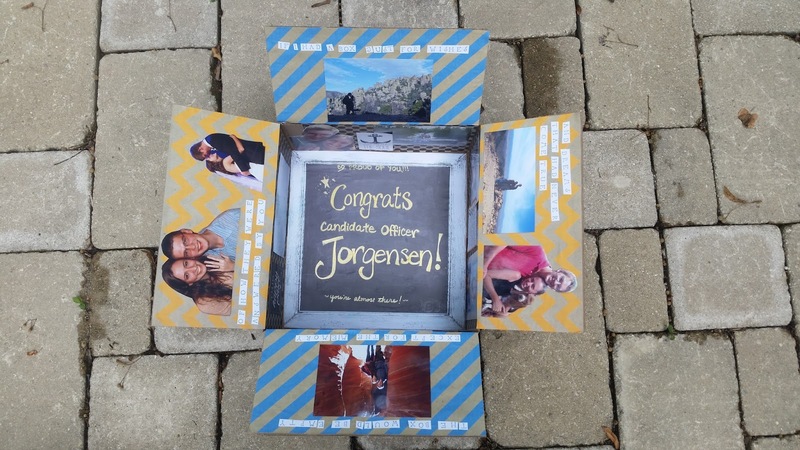 When he finally made it to week 9, I was able to send him his first care package, which they call the “Candio Box” (meaning he had gone from officer candidate to candidate officer). Curtis’ mom and I each decorated the inside of a box and loaded them both up full with candy, snacks, books, puzzles, maps, letters, pictures, and other things we thought he might enjoy throughout his last 3 weeks in OCS!